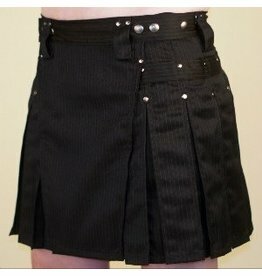 This killer new kilt style ads a flash of contrasting color or pattern to each pleat on its adjustable body. 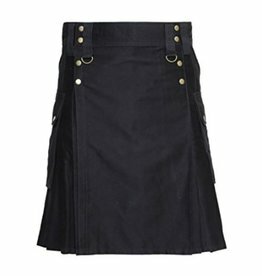 Like our cargo style, but vegan and therefore lower priced, this affordable and fashionable alternative has cargo pockets that are expandableand can carry all of the necessescities in comfort and weith security, thanks to the strong snap flaps of th pockets. 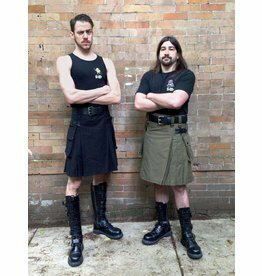 Whether you need to haul camping tools, toys, recreational materials or snacks, this kilt is tougher than your average fanny pack and made to look great and provide ventillation where you need it most! You can order customizable length and special colors to complete a cosplay look or accessorize your nudist fashion sensibilities (but stay legal) with your goods handy. Both the hip and waistline are adjustable for a comfortably tailored fit. Standard length is 16" but can be ordered in custom lengths (allow 8-12 weeks for delivery as special orders take time to make and ship). 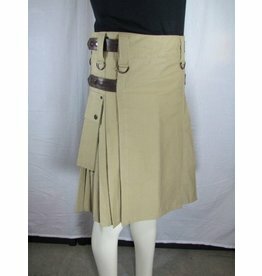 Stock colors are black and burgundy but orderable colors include navy, brown, olive, and khaki. This and all PASSIONAL products are warrantied against manufacturing defects for 30 days from purchase. Misuse voids warranty.